The Southeastern Mediterranean coast of Spain is known for it sun and beaches, but just 30 miles inland the Mountains of Alicante rise up into the sky. Nestled in a ravine sits the town of Alcoy, and nearby the farms of Masía el Altet span across sections of two very different nature reserves. At this high country estate, the Petit family have produced crops and cared for the ancient olive trees that live in the area’s hills and imposing valleys for generations. With its countless species of flora and fauna, and a microclimate that produces wide temperature variations, the land created varieties of olives found nowhere else in the world. The trees shared their wisdom with a young boy from Alcoy, whom years later would return to share what he had learned with the trees. Together Jorge Petit and these ancient olives would come to produce what has undoubtedly become some of the best olive oil in the world today. 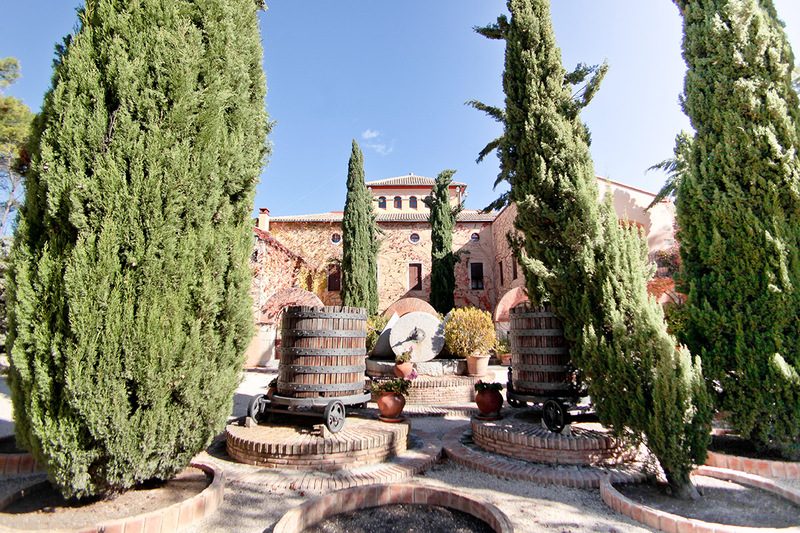 Located in the narrow Polop Valley, the Masía el Altet estate dates to the 1600s. The Valencian government has since declared the main building on the estate a cultural patrimony, providing this marvelous structure special architectural protection. Yet the history here dates back tens of thousands of years, with several important archaeological sites in the surrounding mountains. Of course with Spain’s unique geographical position, every part of the country also has a story from the Moorish era. Every year during the month of April, the town of Alcoy celebrates the Festival of Moors and Christians, an event that started in the 1500s. Dedicated to San Jorge (Saint George), a figure celebrated by different civilizations and religions across the Mediterranean, the festival incorporates a reenactment of the Battle of Alcoy that took place on April 23, 1276. With Alcoy then a border city between Muslim and Christian lands, the area witnessed many skirmishes, culminating with an attack on the town by the Arab troops of Al-Azraq. A hard fought battle ensued, with neither side gaining an edge until, as the story goes, the figure of San Jorge suddenly showed up on the battlefield to rally the Christian army to victory. The Muslims soon retreated and never ventured back to Alcoy. However, Saint George remains venerated by many Muslims, so one could consider his persona a bridge between cultures. Known today as the “City of Bridges,” because of the many bridges that connect the opposing hillsides of the ravine, perhaps it is not a coincidence that Alcoy made San Jorge the patron saint of their town. 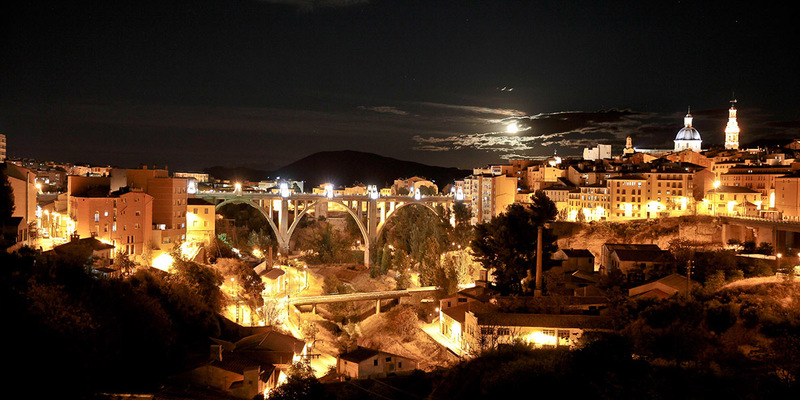 The town of Alcoy at night. Many centuries after this famous battle, another Jorge stepped forward to change the course of the region’s history. Jorge Petit’s return to the farm where he grew up coincided with the family’s decision to focus on olive production. Known for its ability to overcome damage, and (like Saint George) seemingly death, an olive tree can live hundreds or even thousands of years. Jorge Petit attributes this resilience to the intelligence of the olive tree. The olive trees in the Mountains of Alicante have adapted perfectly to the dramatic temperature fluctuations of the area where they must face the snow and low temperatures of the winter months, and then the sweltering southern Spanish heat of July and August. 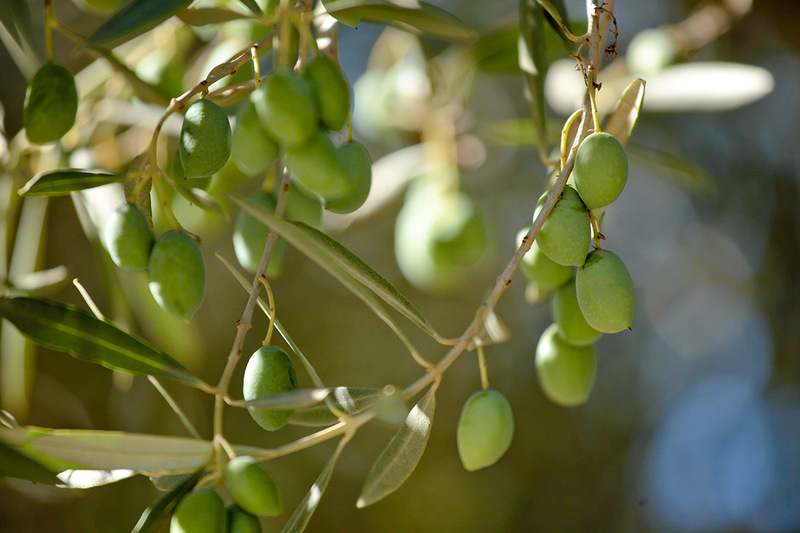 While the temperature variance puts great stress on the olives, any producer of quality oil will tell you that olive trees produce better fruit when under stress. Understanding this, the Petit family decided to convert the areas they had long dedicated to growing almonds, sunflower, and wheat into a single production: olive trees. Officially established as a company in 1995, the initial success of Masía el Altet came by chance. After their first large harvest, they sold all of their oil in bulk to Italy. When the individual who arranged the deal tasted the product, the quality of the oil shocked him, and he insisted the Masía el Altet olive oil belonged on the gourmet market. At this time most producers harvested black, overripe olives to obtain great quantities of oil, but producing high quality oil was always the goal at Masía el Altet. To have started their business by harvesting green pre-veraison olives, the Petits faced a great challenge. Other producers in Spain and in the Valencian community called them crazy, but they knew that green olives produced oil with the most polyphenols, and that these properties made extra virgin olive oil incredibly healthy. This decision paid off when the late French Chef Joël Robuchon, awarded more Michelin stars than any other chef in history, selected Masía el Altet for all of his restaurants. Soon their success reached a new level. Not only did they find it much easier to enter new international markets, but Masía el Altet extra virgin olive oils would go on to win more than 600 awards across 6 continents. The land where Masía el Altet grows their olives deserves much of the accolades for the quality of the oil. Their unique olive varieties also produce flavors that help elevate both the blends and brand itself. However, without the passion and dedication of Jorge Petit, the oils the olives produce would not be the same. As he says, “it is still a cultivated species that requires human intervention in order to bring out the best in itself, and in a great show of generosity, to deliver its finest fruit.” Jorge and his family live on the farm and each day they visit the trees to observe their evolution and return the love and generosity the trees have given them. Jorge Petit claims that he doesn’t know how anyone else operates, or “the way of doing regular things.” His work is simply an every day quest for excellence. Our products are a consequence of passion, love, the land, how the land is worked, and water. Without these elements, it would be difficult to produce one of the best extra virgin olive oils. A favorite of famed French Chef Joël Robuchon, this oil blends Picual and Arbequina with unique local varieties to create fresh aromas of grass, green banana, prunes, and green almonds. It has delightful balance, and tastes sweet and dense with notes of citrus, green banana, artichoke and tomato. Pressed from a careful blend of unique local varieties, the aroma is fresh, elegant and balanced with pronounced notes of fresh cut grass, artichoke, green banana, apple. It has a semi-sweet taste with flavors of endive, tomato and green fruit, with a slightly spicy finish. Produced exclusively from the Changlot Real olives native to Valencia, the herbaceous aroma has notes of freshly-cut grass, fennel, citrus and green banana, with hints of green almond and tomato. With its complex and balanced flavor, this oil complements a wide range of dishes. Pressed exclusively from Picual olives, the oil bursts with aromas of spring vegetables, tomato, artichoke and green almond. The taste is well-balanced, elegant and structured. The spiciness of this oil make it ideal for stronger flavored dishes. During his summer vacations as a child, while his brothers often spent their days hanging out on the beach, Jorge Petit preferred to roam the family estate with his maternal grandmother, Aurelia. His recollections of those times today bring back visceral memories: the smells of different plants, the sound of birds and insects, the light at particular times of day. Jorge left home to attend school, where he trained to become an economist and auditor. But when he returned to the farm after inheriting it from his father, Jorge soon found himself dreaming of recapturing the sensations he remembered from childhood. He soon brought his wife Clara and their children, also called Jorge and Clara, to live on the estate with him, further invigorating the sense of home and purpose. Through his olive trees Jorge discovered the perfect medium to encapsulate his particular universe. 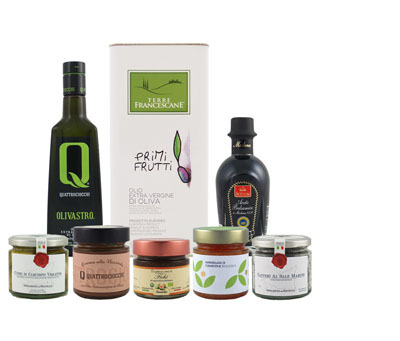 Producing olive oils that held the essence of the land required a reinvigoration of the family heritage, while also taking advantage of the modern advances of integrated agriculture. By living on the farm, walking among the trees became like a meditation where issues can be resolved without hesitation by feeling one with the trees. For example, “if it hails at one particular time, the trees have to be treated immediately and the wounds caused by the hailstone have to be dealt with.” After many years and countless hours of work converting the farm, Jorge still recognizes that he has much work to do. So these days he continues to enjoy the feelings aroused by his childhood memories and feels blessed to be able to create new ones with both his family and his olive trees. 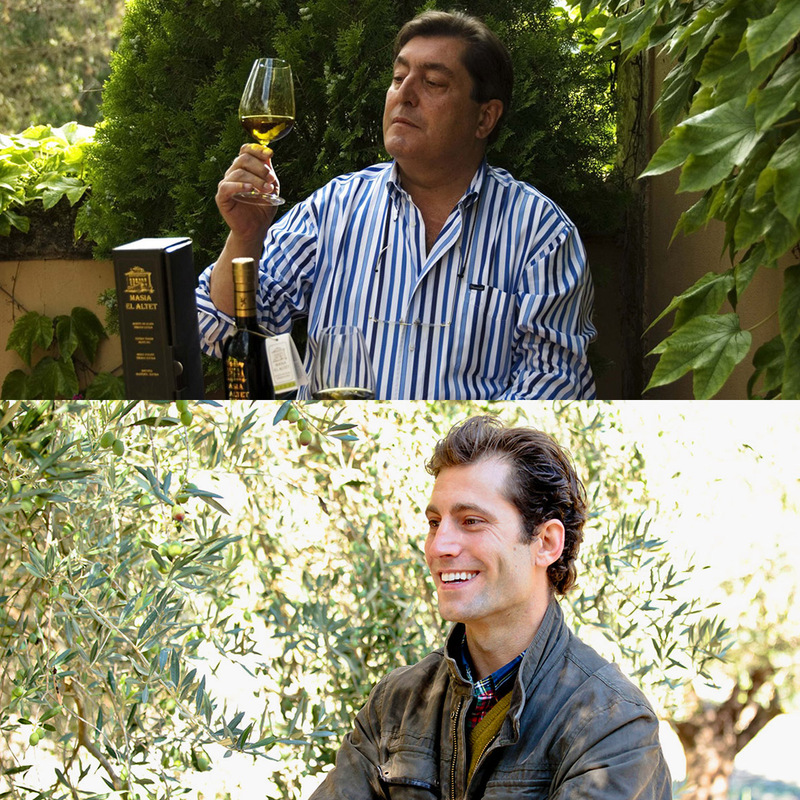 Jorge Petit (above) admires some of his olive oil. His son, Jorge (below), stands happily among the family's olive trees. Together they manage the operations at Masía el Altet. The producers at Masía el Altet focus on quality at every stage of production. When asked to name any particular element that plays a larger role in obtaining the best extra virgin olive oil, they point to two things: determining the perfect moment to harvest olives in their green pre-veraison state; and the cleansing of the olives when they first reach the mill. While these human elements cannot be ignored, Jorge Petit and those he works with at Masía el Altet still give much of the credit to the territory where they grow their olives. 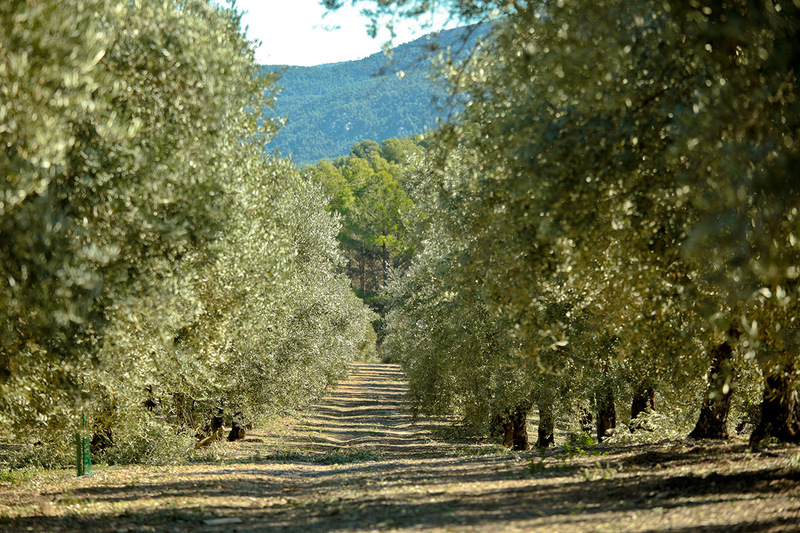 We think the terroir is the most important element for obtaining the highest quality olive oil. A view through the groves of Masía el Altet, with the hills of Alicante in the background. Perhaps the most important factor that contributes to the excellent terroir is the thermal amplitude of the region. Jorge Petit directly correlates the difference between the temperatures at night and during the day to the polyphenol levels of his olive oils, noting that, "we can get easily days with differences of 20ºC (50ºF) between day and night." In instances where the temperatures directly affect the oil quality, Masía el Altet is quick to move on from a lesser quality product. After a massive snowfall arrived towards the end of harvest in 2013, the final 20% of olives collected that year received significant frost damage. The oil produced during those last days clearly lacked the quality one expects from Masía el Altet, so they instead chose to sell it in bulk to another country. To avoid such losses in the future, Masía el Altet has invested in a weather station developed by an American company. The system can provide accurate, continuous, real-time recording of temperature, relative humidity, wind, rain, solar radiation, and even leaf wetness. It also includes analytical features pertaining to disease indices, degree days, chill portions, and wet bulb. Furthermore, its weather and climate module can provide advance notice of impending dangerous weather conditions, immediately notifying the farmers at Masía el Altet when it becomes necessary to take action to protect their olives. To help protect the land that produces such a wonderful product, they also practice integrated agriculture, including re-using the organic matter from pruning, growing a vegetation cover on non-tillage soil and recycling the pomace left over from production. Some of Masía el Altet's pre-veraison olives. To live here is like to be in an island of olive trees surrounded by a sea of medicinal herbs. The farms of Masía el Altet sit between two great natural parks: the Carrascal de la Font Roja and the Sierra de Mariola. The Font Roja is a prime example of a mixed Mediterranean forest, while the Sierra de Mariola has long been known for its aromatic and medicinal herbs. Declared a Natural Park in 1987, the Carrascal de la Font Roja includes a protected birdlife reserve in addition to four plant micro-reserves. This diverse forest provides for many animals, and the reserve also holds one of the last nesting strongholds of rare bird species, including the peregrine falcon, the eagle owl, and the griffon vulture. The park has many evergreen trees common to this part of Spain; however, the deciduous forest that covers a large area of the park is both very rare and highly valuable to the Valencian community. This forest primarily consists of Kermes oak, and also has a rich and varied undergrowth. Some of the most ancient olive tree varieties in Spain live here in this forest, all cohabitating for centuries. But this is just part of the privileged setting that bestows special flavors to Masía el Altet’s extra virgin olive oils. In the neighboring natural reserve, the Sierra de Mariola, a cascade of stony ground descends from the hillsides and rocky outcrops into small valleys carpeted by a seemingly infinite supply of medicinal plants and aromatic herbs. In the late 1700s Spanish botanist Antonio José Cavanilles documented over 1,200 of plants of this kind, and many well known botanists today classify the Sierra de Mariola mountain area among the richest natural plant reserves in the world. While this area has also been enriched by the olive, the particular personality and unique organoleptic properties of the Masía el Altet olive oils can be largely attributed to having this diverse set of flora growing in and around the olive groves. The olive trees grow at an altitude between 800-850 metres above sea level and the soil contains a substantial amount of clay. The microclimate created by both the high altitude and proximity to the Mediterranean Sea provides a unique environment that further distinguishes the olives. The trees also benefit from the natural spring water born in the surrounding mountains. In fact, local laboratories have tested the area’s water supply and determined it to be of such high quality that it could be bottled and sold as mineral water. The privileged location also means the trees live far from pollutants and have minimal exposure to attacks from pests or disease. 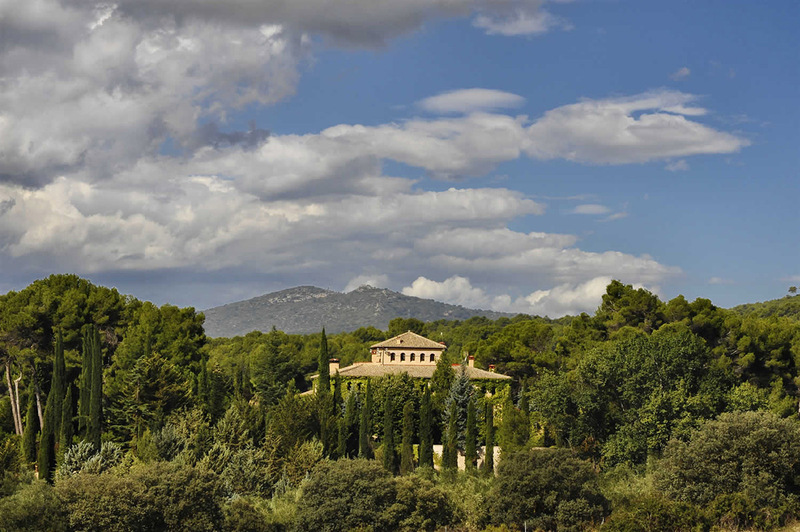 The land farmed by Masía el Altet totals 70 hectares, or approximately 170 acres. The olive trees include 6 different varieties, and number about 14,500 in total. Two varieties very common in Spain produce 80% of the olives, with Picual at 60% and Arbequina at 20%. These are also the youngest varieties on the farm, with the Arbequina trees planted 25 years ago. However, the ancient cultivars produced by Masía el Altet provide special qualities that can be found in no other olive oil. These local varieties, Alfafarenca, Blanqueta, Genovesa and Changlot Real, date to the end of the 17th century. The noted olive oil expert and author, Tom Mueller, wrote in Wine Spectator that, “Jorge Petit’s olives are endangered species with rare, memorable personalities.” Though these old olive trees pose a challenge to harvest, the reward makes it worth all the effort. Masía el Altet Special Selection is produced entirely from the rare Changlot Real variety, while their Premium and High Quality oils both include these unique varieties in their blends. If I had to choose a favorite time of year, I will go for the autumn, when the fruit is on the tree and the harvest is coming. 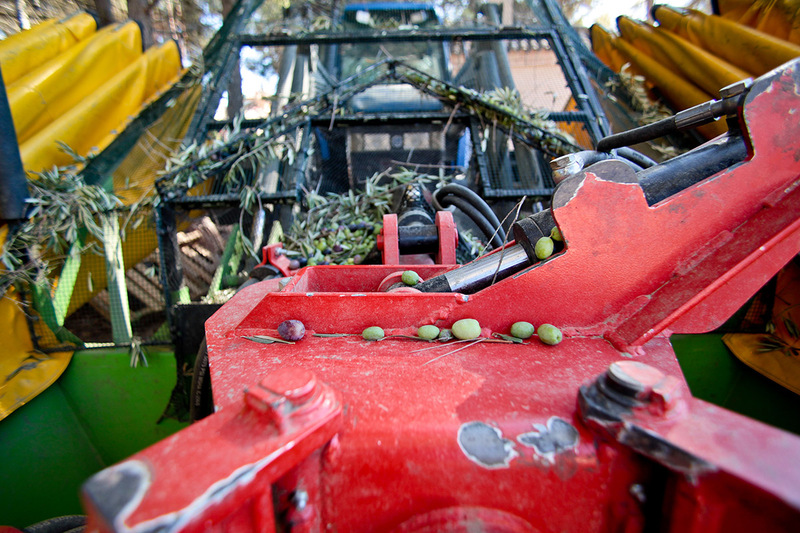 Olive branches and green pre-veraison olives rest on a tractor-mounted shaker. Harvest at Masía el Altet typically begins on the 1st day of November, or occasionally in the final days of October, but always when the olives are green/yellow. All of the trees will be harvested in 10 days to capture the fruit in their peak state of ripeness and acidity. Jorge Petit claims that even if they had more olive groves, the could still only harvest for 10 days before the olive quality would begin to suffer. Due to the specific climate in the region, he estimates that the pre-veraison harvest at Masía el Altet occurs later than anywhere else in Spain. Petit says, “For us the perfect harvest timing comes in November when the cold temperatures are coming.” The harvest workers who pick the olives come primarily from the Alcoy area, and Masía el Altet is proud to support their local community. The older olive varieties require hand picking, as they grow on lands that tractors cannot enter. The other 80% of the olives can be harvested using a tractor-mounted shaker, which is ideal as none of the fruit can get crushed before it reaches the mill. 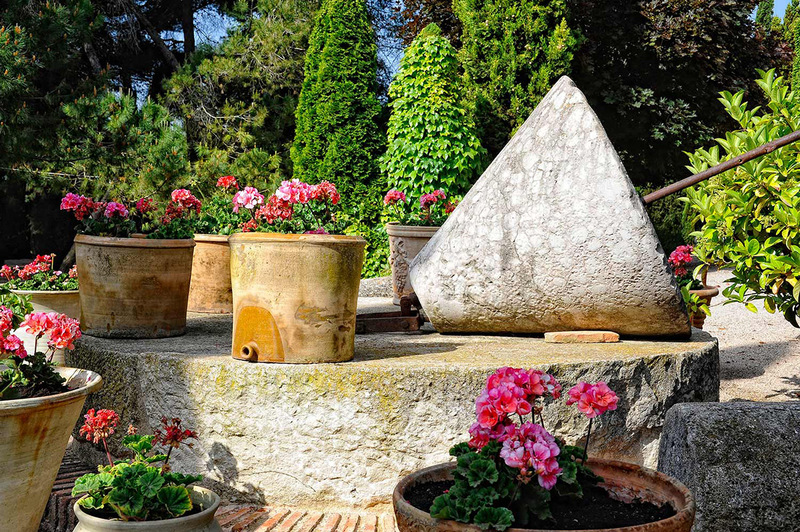 Masía el Altet has their olives crushed by stone mill, believing this method to be the most natural, and one that does not heat the olive mass. For separation they prefer the Alfa Laval advanced dual phase centrifuge, which removes the oil with little to no water. Production typically results in 60,000-70,000 kg of oil per year. After milling, the oil gets stored in a unique facility with tanks designed by Masía el Altet themselves. 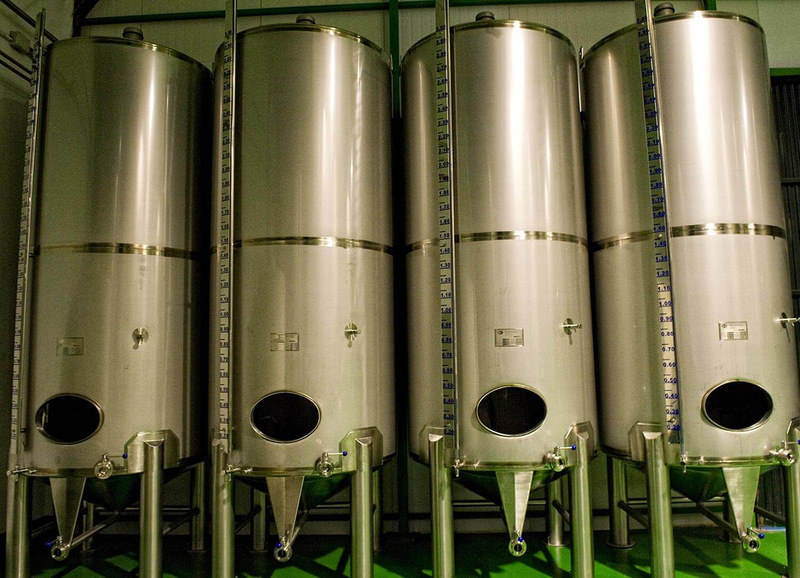 Controlling the temperature of the oil is a major obsession, so their tanks were designed with an additional refrigeration system. They divide the tank casing into three stainless steel sleeves of different diameters inserted inside each other. The inner sleeve holds the olive oil, and a coil of cold water runs through the middle one to maintain the oil at a temperature between 13 and 15ºC. The outside sleeve then incorporates rock wool insulation to make the tank isothermal. With the temperature under control, they additionally protect the oil from any oxidation by piping nitrogen into the tanks. With such stringent protocols to preserve quality, Masía el Altet hopes their customers give the products the same care, and believes their oil should be consumed within 15 days of opening the bottle for optimum quality. An antique stone mill on display on the estate grounds. As the estate house of Masía el Altet is where the Petit family lives, they do not operate any formal agrotourism business. However, visitors who wish to view the farms and estate may send an email to info@masiaelaltet.com to see if a tour of the property may be arranged. Due to the unreliable use of the term "extra virgin olive oil" in the United States, Jorge Petit discourages shopping for olive oil at the supermarket, saying, "if you try those you will never become an olive oil lover." He truly believes that, for any American who has never tried premium olive oil before, tasting Masía el Altet products would be an unforgettable experience. Furthermore, those moments when he can witness someone trying and enjoying Masía el Altet olive oils remain among his most fulfilling experiences. They continue to develop new products and promise to soon be sharing a new Masía el Altet "family member" that delivers the same quality as their other extra virgin olive oils. Taking a sip of this extra virgin olive oil is like taking medicine, but one which is full of flavor. If you get a pure EVOO where you know the origin from where it comes and the passion given to the trees, you will become an extra virgin lover.